Here’s a firsthand account from judges of the district and subordinate courts, where more than 2.99 crore cases are pending, why the docket is so heavy, many of them pending for 50-60 years. Of the nearly 25,000 cases for which the judges have so far provided reasons, “accused absconding” has been cited as the chief reasons for over 7,000 cases pending in the lower judiciary, some of them pending since 1958. Parties not recording evidence before the trial courts; stay granted by High Courts (HCs) and the Supreme Court (SC); absence of important witnesses; parties not interested; and delay in receiving government documents have been cited as top six reasons for perpetual delay in disposal of cases. 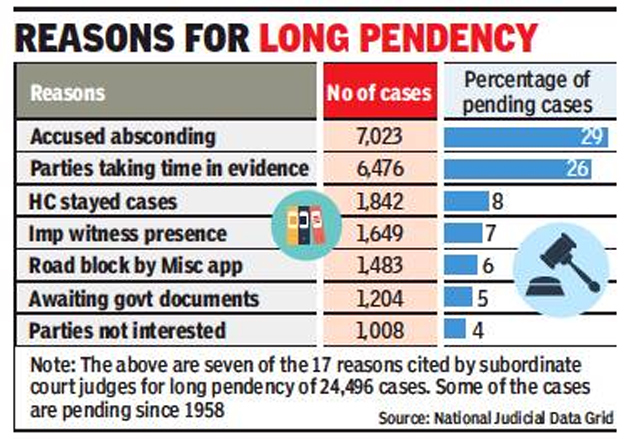 TOI had earlier reported how more than 78,000 cases are pending in district and subordinate judiciary for over 30 years, the oldest pending case traced to 1914. The performance of 24 HCs is equally noteworthy with more than 56,000 cases pending for over three decades. The total pendency in all courts across the country, including the HCs and the apex court, has crossed an all-time high of 3.12 crore. As part of the newly-introduced court management system, it has been made mandatory for lower court judges to record reasons for delay in disposal of cases. However, not all judges have been providing the reasons. The SC and the HC judges have also not followed the latest reporting mechanism in recording reasons of delay. Repeated adjournments have become a norm rather than exception in the constitutional courts, as well. The indifference of the prosecution is palpable. In a case before a junior division civil judge in Buldhana in Maharashtra, a case is pending as the accused is absconding since 1963, according to reasons cited on the National Judicial Data Grid, monitored by the SC. In another case before a senior division civil court judge in Ratnagiri in Maharashtra, the case is pending since 1958 because of a stay granted by the HC. Similarly, a 1968 case is shown pending for final order before a junior division civil judge in Mau, UP because of repeated stay by HC. The other reasons cited by the subordinate judiciary for delay in disposal include obstruction in execution (154 cases); records not available (175 cases); SC stay (170 cases); complex litigation (253 cases); district court stay (116 cases); failed attempts at recovery (841 cases); frequent challenges to HC (197 cases); heavy pendency in courts (371 cases); and legal representatives not on record (1,106 cases). Reasons have not been recorded for a majority of the cases. The first of its kind data has been made available as a result of the implementation of the case management system called CIS 3.0 (Case Information System), an electronic monitoring of all cases filed across the country with current status. The e-Courts reform was implemented under the guidance of Justice Madan B Lokur who recently retired from the apex court but continues to hold the charge of supervising the ongoing reforms in the judiciary. The CIS 3.0, the third generation software update, has helped the higher judiciary and the government to monitor performance of each and every judge, how much time they spend on each case listed before them every day and the record of their disposal. Thousands of district and subordinate court judges have since been reminded of their failure in updating data regularly, to be updated at the end of each day’s work. These facts are also crucial to monitoring the performance of judges of the lower courts as well as the higher judiciary. The online portal NJDG provides status report of each court on cases filed, disposed of, under objection and status of those pending for more than two years, five years, 10 years and over 30 years. Reasons are to be recorded by a judge in case adjournments are granted, which has been restricted to three in the entire life cycle of a case .